At Fastenal Manufacturing, we don't make the common fasteners found on your local Fastenal store shelf — We Make the Unavailable Part Available℠. That includes everything from complex machined parts and high-volume production fasteners to large-diameter bolts and complete stud assemblies. Through our eight global manufacturing locations, we produce more than 70,000 jobs per year — each one a solution for a customer in need. In Fastenal’s early years, if a customer needed a non-standard part, we had to rely on an outside machine shop to manufacture or modify it. … You can guess what often happened next: the quoted delivery date would come, the parts wouldn’t be ready, and we’d shoulder the blame. By the early 1980s the writing was on the wall: in order to provide truly great customer service, we needed to be able to make those ‘oddball’ parts ourselves. 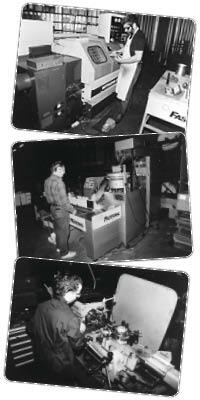 So, when Fastenal moved to a larger location in 1982, two small rooms were set aside to accommodate $30,000 worth of used manufacturing equipment, including a vertical mill, a horizontal grinding machine, a cut-off machine, and a de-burring machine – all operated by a single machinist. As demand for custom parts grew, more machines and operators were added. Before long, our manufacturing operation spilled out into the warehouse, and eventually took over the whole building. By 1990, even that wasn’t enough space, so we relocated to a new, much larger facility, our current manufacturing center in Winona, Minnesota. Since that time, Fastenal has enjoyed spectacular growth, and Fastenal Manufacturing has expanded aggressively to keep pace, adding seven additional global locations, hundreds of skilled operators, and tens of millions of dollars’ worth of capital equipment to meet the needs of our customers – from specialty fasteners to highly-engineered machined components. Along the way, we’ve become a vital part of Fastenal’s customer service and one of the largest custom manufacturing operations in our industry. For 35 years and counting … We Make the Unavailable Part Available℠. As an ISO 9001:2015 manufacturer, we maintain full traceability of raw materials and stringent quality control during each phase of production. With multiple ISO/IEC 17025 accredited labs, millions of dollars in testing equipment, and some of the most experienced operators, engineers and quality personnel in the industry, we don’t just produce parts – we produce perfection. * I have read and agree to the Terms of Registration and the Privacy Statement.